Sizing Large. Small, medium, large, extra large, 2-extra large. Large. Large, extra large. Small, medium, large, extra large. Small, medium, large, extra large, 2-extra large, 3-extra large. Large, extra large. One size fits most. Small, medium, large, extra large, 2-extra large. Small, medium, large, extra large 2-extra large, 3-extra large. Dimensions 11.2 x 4.9 x 0.8 inches. 5 x 3.5 inches. 10.7 x 4.8 x 1.7 inches. 11 x 5 x 0.8 inches. 1.18 x 0.4 x 0.09 inches. 10.9 x 7.2 x 1.5 inches. 15 x 7 x 1 inches. 11.5 x 5.3 x 1 inches. 11 x 5 x 7 inches. 10 x 4 x 0.3 inches. Weight 5.6 pounds. 8 ounces. 5.6 ounces. 7.8 ounces. 5.6 ounces. 6.4 ounces. 9.6 ounces. 4 ounces. 2.4 ounces. 4 ounces. How to Select the Best Chainsaw Gloves? Our hands are used for almost everything, therefore if we can protect them when using dangerous power tools, we should be. In this buying guide we will show you several different chainsaw glove options – all aimed at keeping your hands safe. From the casual chainsaw operator to the professional, there’s a type of glove to suit every occasion. Gone are the days where all tasks – no matter how big or small – were completed with no hand protection at all. We now have so many different types of gloves at our disposal that it can be tricky to know which ones are best. The type of work you are undertaking will help you choose the type of gloves you need. General brush clearing may only require a light pair of gloves, whereas a forestry professional will surely need extra grip, knuckle and wrist protection, and even anti-vibration rubber. This buying guide will help you understand your own needs in relation to your work type. Most gloves can be put in the washing machine after a hard day of use. However, some heavy duty gloves with rubber and armor protection may lose some of its condition when put under the stresses of a full wash cycle. Each pair will no doubt come with instructions for its care and maintenance. This may even include treating any natural leather materials with conditioner. The durability of gloves often depends on what they are designed for. Light maintenance gloves may not hold up to the pressures of everyday use, whereas forestry gloves could keep providing extreme levels of protection with each and every outing. Many manufacturers ensure their brands of gloves are built to suit the toughest of conditions. This could include double stitching, using extremely durable materials and providing inner-armor to protect both the user and the gloves. Although features vary from one brand to the next, many aim for full protection for users undertaking a range of tasks. This could include kevlar lining for increased durability, the use of either synthetic or natural leathers and padded palms for comfort and protection. Where some chainsaws fail to provide suitable anti-vibration features, some gloves try to take the impact through the use of rubber in high vibratory spots. Generally, the more you pay for a pair of gloves, the longer the list of features. This is not a hard and fast rule but it can generally have some truth in it. As noted above, the longer the list of features, the more you may pay for a pair of gloves. Reiterating the fact that this is not always the case, users can makes comparisons between different pairs within this buying guide to get the pair that best suits them. Homeowners may not have to spend a lot for a good pair of durable garden gloves, whilst a forestry worker may have to front up with a little more money. This is due to the extra protection and labor that goes into making them a little more safer than average. They have a durable and comfortable goatskin palm area. They are manufactured with high visibility colors. There is a level of cut resistance in the left hand for extra safety. They offer spandex fabric to make them easy to put on and take off. The price varies greatly both online and in store. The sizing is a little different than how some other brands offer it. They are midway between homeowner and forestry professional. They haven’t quite found their niche. Dimensions: 11.2 x 4.9 x 0.8 inches. QWhere were these gloves made? QWhy is the left glove bigger? QWhy is it the left glove? AThe majority of users are right handed, therefore the less-dominant hand is the left. 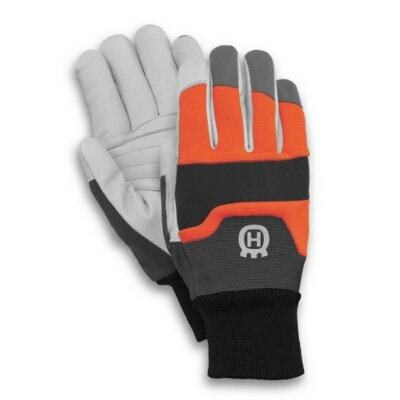 This pair of Husqvarna gloves offers ample protection for chainsaw users in more ways than one. Not only does it offer padding and extra durable material to avoid grease and grime, but it also has cut-resistant material on the less-dominant left hand. This is a nice additional safety feature. The only true negative point about these gloves is the large price discrepancy. They can be cheaper online than instore so it’s best to head to websites such as Amazon to get the best deal. Check out what other people who purchased this product think about it. 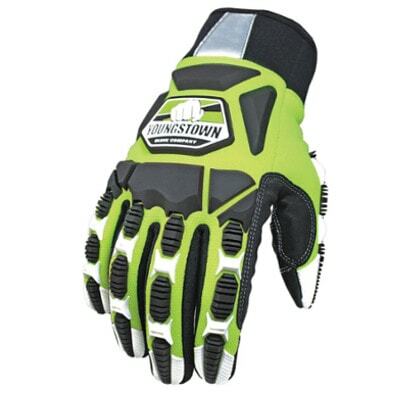 Read Husqvarna 579380210 chainsaw gloves reviews. Most parts of the gloves are manufactured with kevlar for ultimate protection. This pair offers exceptional levels of grip. The thumb features terry cloth which is for wiping away sweat and debris from the face. This is a well thought out feature. Some users note the stitching is not very durable and can come apart easily in places. Some of the workmanship in the manufacturing of these gloves has been poor. Some users find that even with the unconditional guarantee from the manufacturer, they would not provide replacements and/or refunds for poorly manufactured gloves. Sizing: Small, medium, large, extra large, 2-extra large. Dimensions: 5 x 3.5 inches. QWho does this pair of gloves cater to? AGardeners, landscapers, arborists and professional chainsaw operators. These gloves feature unbelievable amounts of protection for all kinds of users. Kevlar coupled with cut-resistant fabric and padding has ensured these gloves can handle the toughest of conditions. However, many users note they are not durable for very long. Stitching can come apart and the padding can wear down and rip open. These gloves are well priced on the market but would be more suitable for light work around the home. Check out what other people who purchased this product think about it. Read Youngstown Glove 05-3080-70-L chainsaw gloves reviews. They have two layers of kevlar protection. The goatskin leather provides good grip. The fingertips and knuckles have additional protection. The material is quite lightweight which gives the impression that it’s not very protective. The anti-vibration padding doesn’t work that well at reducing vibration. The sizing is quite small. Dimensions: 10.7 x 4.8 x 1.7 inches. QDo both hands have kevlar protection, or just the less-dominant hand? QAre the leather components synthetic or natural? QWhat size options are available? 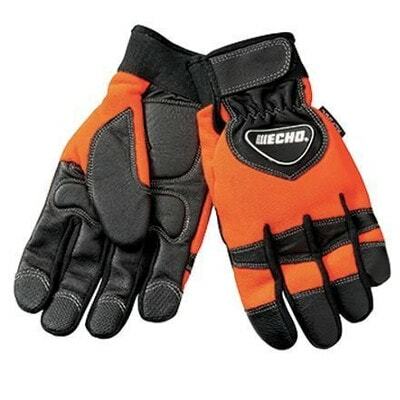 These ECHO gloves provide superior comfort, protection and support for a wide variety of chainsaw users. This includes the homeowner with minimal maintenance through to the professional with a need for something durable. They offer kevlar protection and anti-vibration padding – two essential components in a good pair of chainsaw protective gloves. It’s easy to see why these gloves are some of the best chainsaw gloves for the money. Check out what other people who purchased this product think about it. Read ECHO 99988801601 chainsaw gloves reviews. They have eight layers of kevlar on the left hand. Both hands aren’t equally as protected due to kevlar in one glove only. They aren’t very protective in most areas of the glove. The stitching isn’t very durable in some pairs. Dimensions: 11 x 5 x 0.8 inches. QDo they meet any safety standards? QHow much protection does the left glove give with its kevlar lining? AIt can protect against a running chainsaw at 3140 feet per minute. QWhich industries are they suitable for? ABackyard maintenance, forestry, construction and agriculture. These gloves sit at the mid-to-high point on the price scale, yet they fail to protect your hands as well as other brands do in comparison. The left glove is well manufactured to withstand accidental cutting, but the right glove only has basic protection which can often fail against brambles and thorns. They will work well in landscaping and gardening but not so much for forestry work. This is why they aren’t top rated, nor are they the best chainsaw gloves for the money. Check out what other people who purchased this product think about it. Read Superior 385CS chainsaw gloves reviews. They have reinforced palms to help reduce vibration from the chainsaw. They are constructed of leather which makes them a bit more durable. They are a vibrant color for better visibility. The less-dominant left hand has added protection. It would be better if both hands were protected equally so the gloves didn’t feel mismatched. They don’t appear to be suitable for forestry professionals. Some users note stitching comes apart easily. Sizing: Small, medium, large, extra large. Dimensions: 1.18 x 0.4 x 0.09 inches. QDo they have any kevlar? AIn the left hand only. QDo they protect from thorns and brambles? AIt can give some protection, but the true point of protection is the kevlar in the left hand. QDoes the leather harden with wet weather? AYes, but with use it becomes smooth and supple again. Although designed for a wide range of industries, these gloves lack protection where it’s vital. The leather, although smooth, doesn’t stop general backyard thorns and brambles, and the anti-vibration padding doesn’t work as it’s designed to. Many users also note stitching can easily come apart. However, for the cost, they are very practical gloves for homeowners and are protective for general use. They are just not overly suitable for everyday forestry use. Check out what other people who purchased this product think about it. 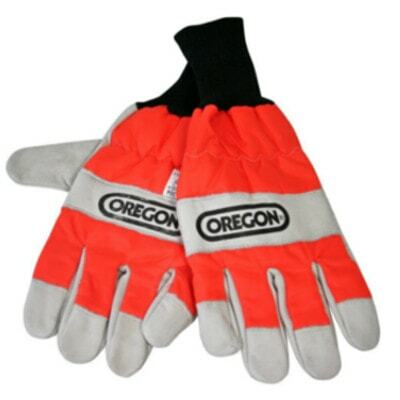 Read Oregon chainsaw gloves reviews. Both hands are cut and puncture resistant. Both gloves are lined with kevlar. Thermoplastic rubber is strategically placed along the fingers for additional protection without restricting movement. They are a bright color for better visibility. They lack grip for climbing. The stitching can be poor. Some components rip and tear easily without too much use. Sizing: Small, medium, large, extra large, 2-extra large, 3-extra large. Dimensions: 10.9 x 7.2 x 1.5 inches. QAre they equally protective in both hands? QCan they be machine washed? These Youngstown gloves are suitable for a wide range of users and that’s what makes them so popular. From the forestry professional to the construction worker or landscaper, they are very versatile. 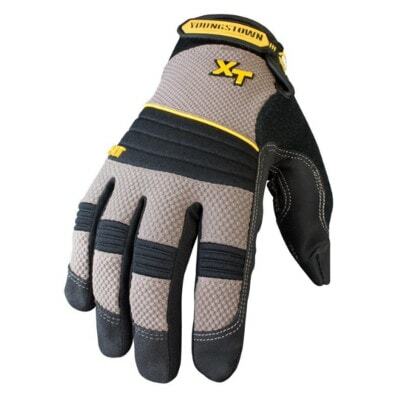 These gloves offer ultimate protection in any line of work. They are fully lined with kevlar in both hands, as well as offering good visibility and anti-vibration padding. They also have thermoplastic rubber along the fingers for extra protection. Some users note lack of durability but overall they are some of the best chainsaw gloves for the money. Check out what other people who purchased this product think about it. Read Youngstown Glove 09-9083-10-L chainsaw gloves reviews. The left hand has prolar protection. They are certified to world leading standards. The cuffs stop debris getting up the user’s sleeves. They would feel less mismatched if both hands had equal protection. They are quite heavy in comparison to other brands. Dimensions: 15 x 7 x 1 inches. QDo they have any safety certifications? ACE EN 388:4244 and CE EN 381-7. QWhat is the palm area material made out of? 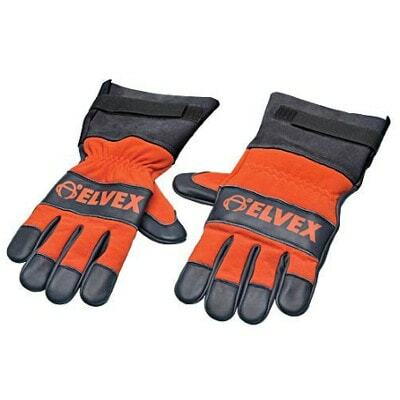 These Elvex protective chainsaw gloves represent good value for money. They meet world leading safety standards and provide good protection against chainsaw accidents caused by kickback. They are also a well made glove with prolar protection and cuffs to stop debris from irritating the user’s arms. They are not top rated on the market, but they are some of the best chainsaw gloves for the money. Check out what other people who purchased this product think about it. Read Elvex CSGLV-LG chainsaw gloves reviews. They are manufactured with premium goatskin leather. They are very durable and don’t restrict movement. They are breathable which proves effective in hot climates. They have a small target market due to their lack of protection for heavy use. ‘One size fits most’ may not be suitable for those with very small or very large hands. Dimensions: 11.5 x 5.3 x 1 inches. QAre they suitable for industrial use? QAre they lined with kevlar? QWhat are they suitable for? AGeneral outdoor work such as landscaping and gardening. For the cost of these gloves you would expect a better level of protection. 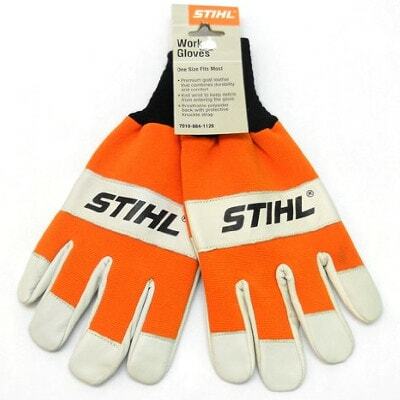 However, STIHL is a good brand, therefore you can expect this pair of general work gloves to stand the test of time. They are largely suitable for homeowners and those undertaking light work outdoors. They are breathable which is great for hot climates and they also feature goatskin leather which makes them comfortable and soft. Overall, they are a good general wear glove for homeowners. Check out what other people who purchased this product think about it. Read STIHL 7010 884 1126 chainsaw gloves reviews. They have non-slip material on the palm area and the fingers for better grip. There’s terry cloth on the thumb for wiping sweat from the user’s face. The several different materials make this glove very durable and flexible. The harder surfaces on the gloves such as the underside of the fingers have been known to crack and split. The finger stitching comes apart easily for some users. With everyday use they wear out fast. Dimensions: 11 x 5 x 7 inches. QDo they provide equal protection on both hands? QWhat kind of work are they suitable for? AAll kinds – forestry, landscaping, construction and general home use. Out of all gloves on offer, these Youngstown gloves offer the most protection. However, they don’t offer the best durability. Stitching is known to come apart quite easily and with every day use they don’t last as long. For those who require heavy duty gloves only very occasionally though, they fit the bill. For the cost, they also have a lot to offer. The design process has been very well thought out with even the user’s sweat taken care of by a sewn-in terry cloth strip. They are not the best chainsaw gloves for the money but they are certainly very close. Check out what other people who purchased this product think about it. Read Youngstown Glove 03-3050-78-L chainsaw gloves reviews. They have a patented roll top design on the fingertips which allow for additional protection. TThere’s a terry cloth strip on the thumb to wipe away forehead sweat. They are too lightweight which gives the impression that they’re less protective. The fingers can easily get holes in them and split down the seams. They don’t grip things well due to the slippery leather. Sizing: Small, medium, large, extra large 2-extra large, 3-extra large. Dimensions: 10 x 4 x 0.3 inches. QDo they protect well against punctures and cuts? AThey offer EN388 cut level 1 and a EN388 puncture level 2. 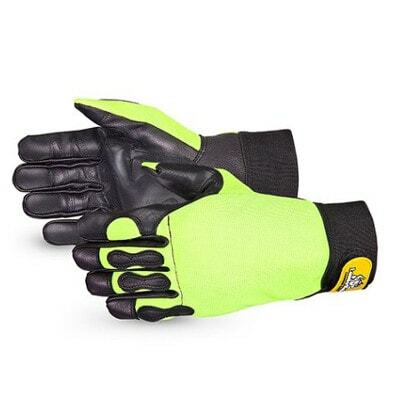 These gloves offer a medium level of protection in chainsaw use and industrial work. They are kevlar reinforced with palm padding and have roll-top fingers for additional support. They are a little on the light side which can give users the impression they aren’t very heavy duty. Some users also note stitching quality is poor. 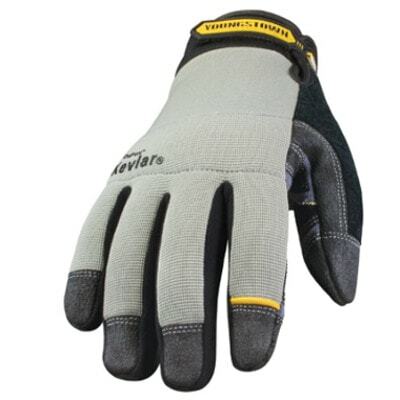 These gloves are best suited to casual users rather than everyday forestry professionals. They are, however, available for sale online at a reasonable price. Check out what other people who purchased this product think about it. 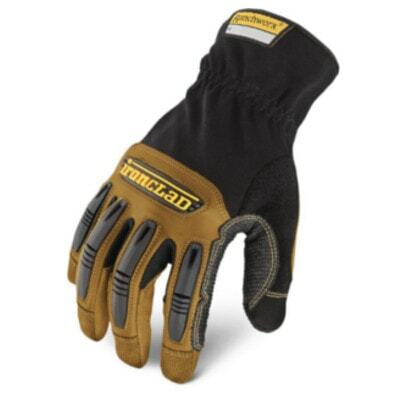 Read Ironclad RWG2-04-L chainsaw gloves reviews. Where to Buy Chainsaw Gloves? Chainsaw gloves are for sale online on websites such as Amazon, as well as in stores worldwide. Due to the competitive market, you are sure to get the best deal for any brand of chainsaw gloves online.